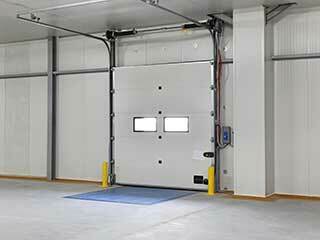 The springs are in charge of supporting the weight of your garage door and helping it move up and down. Since the weight they carry is quite heavy, these components are under a lot of stress, and will eventually break if they aren't replaced in due time. Handling them can be dangerous, so you need to make sure a technician does it for you, in order to avoid the risks. If you'd like to extend the lifespan of these components, you can have our team routinely examine their condition and take the necessary steps to ensuring their optimal operation. We can adjust their tension to make sure it is evenly distributed and that they aren't overstraining. We'll also lubricate their coils to keep their performance efficient and smooth. There are two types of these components that are commonly used today, and both of them can be dangerous if you're not one hundred percent sure of what you're doing. A torsion spring (usually just a single one is used, unless the panels are very heavy) is installed above your door, across a bar. It twists in order to generate the required tension and then unwinds to release that tension and raise the door off the ground. Extension springs are usually installed in pairs, each one on a different side of the door. They stretch and contract in order to accomplish the same goal. Although torsion springs are considered the safer of the two, they can still be quite dangerous. Any component that deals with that much tension and weight can cause serious harm if it is mishandled. That's why you should never try to handle these components by yourself, and instead contact our team at Garage Door Repair Texas City. Our professional technicians can complete any spring repair or replacement task.